My specialties include the areas of Round Rock where I have lived for 30+ years, Georgetown, Cedar Park, Leander, and Austin. We love Central Texas! I have 3 children and 5 grandchildren so I understand the needs of parents and therefore I welcome your children to accompany us on our house hunting adventures. My kids loved looking at homes and of course your new home will be their home too. I understand the importance of schools and proximity to extracurricular activities and will provide abundant information about school ratings and activities so you can chose the area of Round Rock or Austin that is best suited for your family’s needs. 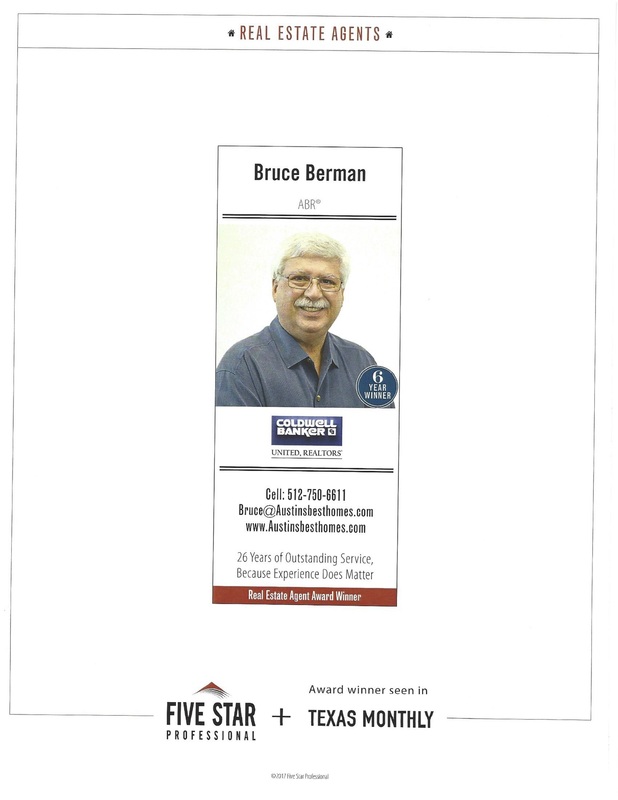 For the past six years I have been honored as Five Star Professional and been featured in Texas Monthly Magazine. This award is voted on by consumers and less than 2% of agents earn the distinction. Thank you to my clients for voting and continuing to refer friends and family to me. If you have questions about Round Rock and Austin homes please don’t hesitate to contact me. Our adventure toward your home buying or selling success cannot begin until to take the action and contact me. I appreciate your time and interest in visiting my website and look forward to hearing from you! Please notice that you are free to visit my website and search for homes in Round Rock without having to log in and give me any contact information. I can be a valuable information resource for all of your real estate needs and will only ask for contact information if you want listings emailed to you or would like me to send you specific area information.